The 2017 Kia Sportage SX Turbo combines convenient features and technology with a fun drive, making it the generation that might finally turn American buyer's opinions. Driven side-by-side, two very different takes on the popular small crossover SUV category produced a revelatory experience: The ever-improving Kia Sportage now feels a little like a Range Rover compared to the largely unchanged, brittle and overly precise Volkswagen Tiguan. The Sportage is, by direct comparison, spacious and very comfortable on the road, packed with a nice range of convenient features as standard options and technology at the SX level (there’s even a Harmon/Kardon stereo system nowadays). Its only misgivings are that long-term brand misrecognition and an overly busy front fascia redesign that doesn’t quite work, but is forgivable. This generation might be the one to finally turn around American buyers’ opinions. Tiguan, on the other hand, is all hard-edged German technology and a crisp and not particularly huggable character on and off the road, though it’s still good looking and is rated for slightly better highway mileage than the Sportage. VW, as you may have heard, has had some recent PR problems. The Kia was much more of a joy to drive, overall, its only foible being its need for slightly strong steering inputs. The top-of-the-line 2.0-liter four-cylinder turbo provides 240 horsepower and an enjoyably strong 260 lb.-ft. of torque, which made for satisfying high-altitude cruising. During an uphill Boulder to Vail journey on Monday, I still got more than 25 MPG. Kia now feels like a slightly downsized Jeep Grand Cherokee in its overall presentation, with a tall seating position, lots of upright glass and a full-cabin sunroof to add to that expansive feel. More importantly, it very comfortably absorbed all of the bumps and ruts in the roads, with a more spacious overall character — even though its 176-inch length is only a couple of inches longer than the Tiguan. The 4Motion AWD-equipped Tiguan rides awfully roughly and its own 200-horsepower 2.0-liter turbo four, now standard on all models, struggled a bit to keep consistent speed on the highway and even dragged a bit when I didn’t have the pedal mashed — despite being some 400 pounds lighter than the AWD Sportage. Tiguan also reminds you consistently of that precise-to-a-fault German character, with a clean but sparse interior, rigid seating and fewer bells and whistles — though the SEL model also includes a very vibrant Fender audio system and a much-improved and dynamic Discover Media system with good navigation and VW’s Car-Net navigation, security and service connections via a smartphone. Sportage, on the other hand, offers plenty of the perks of its larger cousins: blind spot and rear cross traffic alerts, lane departure warnings, automatic emergency braking, plus heated and ventilated front seats, power-folding mirrors, an eight-inch navigation touchscreen with Android Auto and Kia’s own UVO smartphone security and service system. There’s even hill descent control, should you opt to take the vehicle down some demanding off-road hills. Paddle shifters for the impressively fast-acting eight-speed transmission and even a flat-bottomed, race-styled steering wheel also amp up the Sportage’s more user-friendly and enticing feel. Plastic is much harder to find in the cabin, with a flat-topped, rubbery dash cap and rectangular vents that give it a distinctively futuristic appearance that’s far more evolved than the Kia Soul-inspired console module of recent years. A bit of piano black on the window controls and radio faceplate also class it up. Neither are spectacularly large for rear passengers but still offer basic comfort; Sportage offers 60 cubic feet of storage behind the front row and 38 inches of rear legroom, while the Tiguan’s cargo area is 56 cubic feet and about 36 inches of rear legroom. If it comes to looks, Tiguan may still have a slight leg up as its cleaner and more classic VW fascia and grille do complement its overall package. 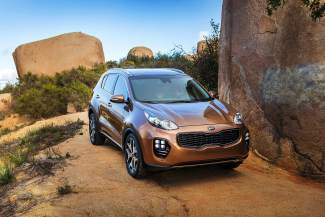 For 2017, Sportage crammed too many Porsche Cayenne-styled details into one crowded face, including the Kia’s own four-lens foglamps and a bowtie-shaped grille that now sits just a little too high for its own good. Your judgment call on a small crossover will no doubt use a different set of attributes, but for their nearly identical price tags and overall dimensions, the Kia certainly seems like a better (and more powerful) deal.